Some like them hot, some like them spicy, some like them chopped, some like them dicey! No matter how you like them, chili peppers are one of the best vegetables – okay, okay, they are technically fruits, but we are so not going to have this argument here are we? Good, because it’s pretty likely that we can agree that no matter if they are a fruit or vegetable, chili peppers add an extra kick to a simple soup or a sad souffle! Chilis can take any normal meal and set it on fire. Put these on a sandwich and you'll end up with something spicy. You can also add these red fiery veggies to your salads to make them extra zesty. 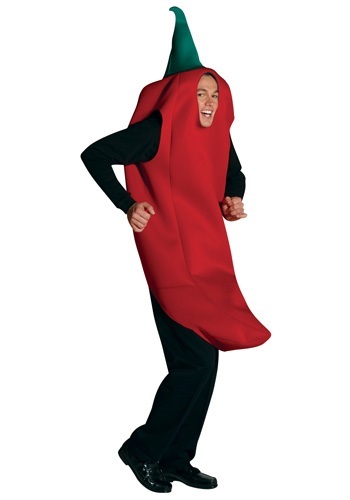 Now you can become the tasty, spicy veg in this great Chili Pepper Costume. Once you suit up in this fiesta sized costume, you may be struck with the urge to salsa, so do not resist, dance the night away! You will be able to put a little pep-per in your step, and spice up the dance floor with your flamin’ hot moves! Who knows, you may even find a cute pepper who is Jalapeno business! Wear this fire red Chili Pepper costume to a Halloween party, Cinco de Mayo fiesta, or maybe even to a concert, you are sure to be red hot! This pepper costume is 100% polyester, with a red chili tunic, and a green stem stop.